For the hearts pictured, I used small amounts of sport weight cotton. The hearts measure (unblocked) about 5-1/2” at the widest point and 6” in length. 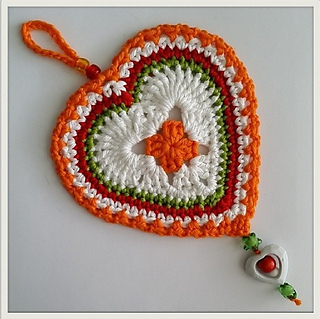 To make them into buntings, crochet a chain and attach the hearts with double crochets into one or two of the border loops, while evenly spacing the hearts along the chain as you crocheted it. I plan to use some of my hearts for coasters. I also plan to do some with worsted cotton for dish cloths. Don’t you agree that they’d make super gifts. Who doesn’t need a little fun and color in the kitchen? I hope you enjoy making these colorful hearts as much as I do. Please let me know if you find any errors so that I may correct them.